In his 2015 book, "Il Fango e il Segreto" ("The Mud and the Secret") , Lino Lista points out yet another egregious example of Kiko Argüello's penchant for twisting Sacred Scripture for his own sectarian purposes... Read more. Kiko, the great magician, fits all Scriptures according to Neocatechumenal Way. It is something fascinating, when you are into the Way, to feel the Neocatechumenal Way was such a prefigurated charisma in the Scriptures. They constantly make you feel it really was and that is why it is so hard to belive that bishops, priest and ordinary catholic people reject it. They bombard you with that idea: the Way was prefigured by God. Kiko has just being brightly lit to reveal it. So, if you doubt about the Way, you are doubting about God’s designs. It’s with the Way or against the Way as well as with God or against God. And that is why the slightest criticism about the Way comes from the Devil. I say that Kiko is a great deceiver, and it goes against reasonable thinking how many Bishops and Priests who are responsible for the teaching and transmission of faith from Christ and the apostles have fallen victim to Kiko's ploy. Can we say that they are also not solidly rooted in their faith and have fallen prey to Kiko's wiles? I think these Princes of the Church see the great numbers attracted to the cult and judge the masses as fruits of their positive catechesis, and don't bother at all to verify at all if the substance of the catechesis is authentic. That the bishops support the Way because they "judge the masses as fruits of their positive catechesis" is probably the most charitable explanation, but there are other reasons too. Quite a few bishops are compromised by the significant portion of the 2nd Scrutiny donations that are given off the books. At least one bishop in Europe lives in a house purchased by the Neocatechumenal Way. How many more have been given such assets? Anonymous said: "I think these Princes of the Church see the great numbers attracted to the cult and judge the masses as fruits of their positive catechesis, and don't bother at all to verify" and is absolutely right. In Cruxsancta blog, where some former members of the Way write, we use to say NCW is based on "the reign of quantity". If you analyze Kiko's speeches and catechesis, they are full of great numbers quite difficult to be contrasted. Kiko always underlines facts with large amounts of everything. "One hundred RM Semminars", "two thousand of boys to mission", "seventy thousand of young people evangelizing on streets"...and so on. If we played the same game, we must remain that if there are one and a half million of neos in the hole world, there are at least five million of former neos in the same hole world. If we were able to make bishops to be aware of that, maybe things would change. We should tell every bishop how destroying the Way is since the moment there are most people who left it than people who stay in, and the worst is that those former people (five million at least) use to leave the Church because the Way instill the idea that leaving it is the triumph of Devil in their lifes. Then we would notice the disgusting reality: bishops receive money from one million and a half people in the Way but no from five million former members lying in the ditches. The Way was suposedly for calling those people who were away and the picture is more like Attila's horse...grass never grows up where it goes through (sorry the simple translation). It devastates everything. There is a quite simple way to contrast Kiko's kingdom of quantity. But it must be spoken in private. Anyway, Kiko should need to receive his own medicine. Let's talk with bishops with reign's quantity language. I listened for the first time all of the recorded evidence uploaded on Chuck's site. Thanks Chuck for providing a site where we can hear for ourselves the evil and misguided information disseminated by His Unholiness Pius... Listening to him talk down to the people; makes me wonder why so many remain as a member of this evil cult. Anyone can tell from his looks and his tone that he is pure evil. I agree that he seems to place great emphasis on the scrutinies. And this is the reason People should think twice about this cult. The Greatest gift that God gave us in his Son through the Holy Spirit is handed down to us in the form of the Sacraments. I cant believe that Kiko, Apuron, or our Church Leaders would hold a greater prminnence in this pow wow at a hotel, and make is a reaquirement for one of the faithful, or else you are lost forever. Jesus himself does not force us to receive the Sacraments, he calls us to freely approach the table of the Lord and what he gives us is the Sanctifying Grace from God. This we can never get from Kiko, Pius or the NCW. In the preface of Dominus Christos, We read "The bishops themselves, however, having been appointed by the Holy Spirit, are successors of the Apostles as pastors of souls. (3) Together with the supreme pontiff and under his authority they are sent to continue throughout the ages the work of Christ, the eternal pastor." They can choose to follow the will of the HS or their will, and when we see them allowing heretical teaching over the truth in Christ's church, there is no assertion that they are following their will, for whatever motivation, material or Power. Think 3rd secret of Our Lady of Fatima. Pope climbing up to the cross witnessing the many lost souls along the way. Lost because they were misled into sin due to Pope and priests misguided souls into false path to Christ. 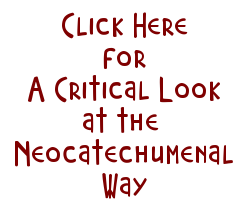 Do you not see how neocatechumenal way could easily be the path which many of the faithful are misguided? 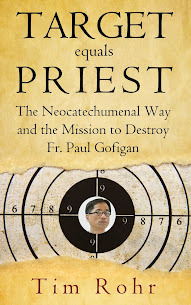 Call it discernment or instinct or awareness that neo way is not catholic. Freedom to chose or free will. Pray and know your faith because evil is allowed to flourish for a reason. I don't care how many millions of people the neo recruits.wrong is wrong. its notjudging.its likeknowing notto touch fire Or run into traffic. Peace. thanks again for sharing this info, chuck. to offer a comparison with, shall we say, "the tactics of persuasion" employed by kiko, the secular/third-order carmelite community i joined is completely different. an inquirer is expected to attend all regular meetings, but is allowed two excused absences in a year. pretty reasonable expectation for any community or association, right? no coercion, no guilt trips. prayerful discernment and study are always emphasized, and of authentic Catholic sources, not kiko-ish stuff. on the plane trip back to the island, i read sherry weddell's book "forming intentional disciples," which centers on pretty much the same goal that the ncw markets itself as pursuing: evangelizing or re-evangelizing people. but whereas the kiko way is alien to Catholic teaching and is separatist, her book outlines how to evangelize within the parish setting. highly recommended reading. i think the biggest lesson that the ncw has taught us is that the ncw came and got a foothold on power because it filled in for what had been missing from guam's Catholic parishes for at least a generation: the authentic evangelization of its own baptized people. many infections occur because the body is too weak to resist it. Thank you for reminding us of the Third Orders, Rey. Many of the Church's religious orders offer a "Third Order" healthy, orthodox, alternative for laypeople. If I remember correctly, St. Francis started his Third Order first, and others, like the Dominicans and Carmelites, followed suit in their time. Thank you, Rey d. I agree with you about the lack of continued in-parish evangelization or continued adult formation. These are the same buzz phrases used by the NCW to legitimize and market itself, but their process, as we know is cult-ish and many of their teachings heretical to the Catholic teachings. Catholics need continued and even life-long shoring-up of their faith in addition to the regular participation in the mass, participation in our other sacraments, and other practices of our Catholic culture. In-parish evangelization and faith deepening opportunities can be simple. It doesn’t have to be as elaborate as starting a movement or program. It can be a single or multi-part in-parish class to develop one’s spirituality or understanding of our faith. In my parish, for example, this winter my pastor is teaching a 3-Monday night class series (1-1/2 hours long) titled “In His Image.” Another example is that each quarter we have on-going scripture study classes taught by one of the two deacons in our parish. By scripture study, I mean we are taught the context of the writings based on the culture, the practices, the original words used and their closest interpretations to English words, and the beliefs of the time. As a student of these classes, putting the scriptures in context really opens up their meaning. Last fall quarter we studied the Gospel of John and for the first time I learned the significance of the details of the crucifixion in the way John wrote it --- the meaning of the “unblemished lamb” as a sacrifice and how that connects to the significance of Jesus’ legs not broken by the soldiers when he was taken down from the cross; the use of hissop to quench his thirst and the same use of hissop to paint blood on the lentils of the doors in the Exodus story, etc. I used to have difficulty with John because his writing is, to me, full of imagery which gets in the way of my understanding him, but last quarter’s class made me like John’s gospel over the other three. Talk about a total turn-around! I had classmates in their 70s and in class when we hit a Euricka moment they say something like, “How come no one ever told me this? !” See, no matter how old you are, there is always something to learn about our faith. This winter a class on Revelation is underway. This is another book in the bible that is full of imagery and in which I have difficulty understanding so I’m looking forward to this class. On Guam there are local clergy, religious, and laity with expertise on teaching adult faith formation/faith deepening classes. What is needed is time and textbooks. Text books cost $15 on the average and that cost is passed on to the students who sign up. Believe me, $15 is soooo worth it to know more about our faith. Ave Maria Press and Ignatius Press offer adult education series complete with a teacher’s guide and video for additional lectures on each section of the lesson plan. There has been many mention in this blog about the Faithful’s part in current mess of the church. As Rey mentioned, there is little (if at all) any alternative to continued adult faith formation than the one claimed to be offered by the NCW. Perhaps it’s time that the true Church gives the NCW some competition in the area of faith deepening and adult formation. I am continually dumbfounded that Kiko's followers can accept that the attendance at the scrutinies is essential for salvation. Maybe they are comparing this particular instruction to what is taught in the Catholic Church to honor the Lord's day by regular, weekly attendance, BUT with the understanding it is expected to do so the NC Way! Year after year, I hear the Priests explain this Parable to mean that we should live our lives not knowing the day or the hour when God will call and, therefore, we must be prepared to explain how we have lived our lives --with the "oil" of good works or not. To the neo follower, trust what you heard, and ask questions if you are confused by the contradiction between the interpretations. Go home and google it when they embarrass you for questioning them. Matthew chpt 25, 2-4: "Foolish... Wise: of the contrasted "wise man" and "fool" of [chpt] 7, v.24, 26, where the two are distinguished by good deeds and lack of them, and such deeds may be signified by the oil of this parable." 25, v.13: "Stay awake: some scholars see this command as an addition to the original parable of Matthew's traditional material, since in v.5 all the virgins, wise and foolish, fall asleep. 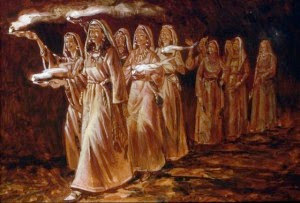 But the wise virgins are adequately equipped for their task, and stay awake may mean no more than to be prepared;"
I hope and pray that our brothers and sisters in Christ who follow the ncw DO listen to the Holy Spirit and DO simple research to answer any of their doubts. GOOGLE it! Open your bible! Do something! Don't just sit there like a sponge absorbing what they say! Ask questions. LOOK and READ for answers. Peace be with you! Aaaahhhhh. But NCW neo-phytes are not allowed to ask questions. They are taught to sit silently and absorb all that Pius spews their way. Their mind is separated from question. A true cult indeed. I can appreciate the intimidation they feel when Pius is present, but I pray that when they are in the privacy of their own home, that they will ACT by using the internet, by opening their Catholic Bible and read what it has to say relative to the Book, Chpt and Verse that Pius may have referred. Better yet, ask the question here on junglewatch anonymously. I agree with ANON 11:04. I know. I used to walk. It is all our personal responsibility to search the truth and arm ourselves with the truth of our Catholic faith, and to live it daily, armed with the truth and the grace of God we can combat the errors of our time. God help us all. It is true that Sacred Scripture is polyvalent, however Kiko in this instance is twisting scripture to fit the needs of his cult. This is just another reason that we need to listen to the Church Christ left us and not mere man. Dear Chuck, I am asking you ifyou have time to read my two books against Kiko Arguello. Please send me your email.